The data is clear: diversity improves financial success. The presence of more women and minorities on boards and in the C-suite are positively correlated to financial success across industries. Diverse teams outperform their more uniform counterparts. Diversity extends beyond simply looking at gender, race, and age into ways of thinking, background, experience and everything that makes up “culture”. Mckinsey Report on Diversity Summarized - McKinsey’s report, “Diversity Matters,” was published in 2015, but in light of the growing discussion on diversity in the IT industry, a summary of the results will prove helpful to many. Louda Peña From Thoughtworks on Making Diversity Normal - Following on from the awards and recognition that ThoughtWorks has received for inclusiveness and diversity, InfoQ spoke to Louda Peña about what it takes to foster a genuinely diverse and inclusive workplace in a global technology company and her own experiences being part of such a culture. 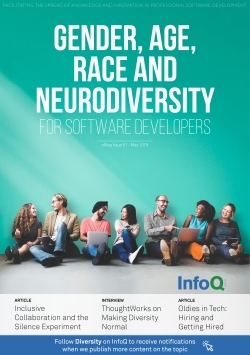 Inclusive Collaboration and The Silence Experiment - With highly collaborative approaches becoming the norm in the software industry, it is time to re-consider collaboration and provide workplaces and practices that embrace all kinds of thinkers. This article introduces Inclusive Collaboration and describes the Silence Experiment to help teams consider different aspects of collaboration and work more effectively with all types of minds. Oldies in Tech: Hiring and Getting Hired - Denoncourt gives advice to older job seekers with tips on how to go about writing cover letters, filling out resumes, handling themselves in interviews, and preparing for difficult questions and coding assessments. Employers will change their perspective of older applicants and see the benefits of hiring sage programmers that are smart, love learning and have a track record of success. Culture and Diversity: Why They Belong Together in Every Tech Organization - Why They Belong Together in Every Tech Organization - Culture and diversity can help a company’s bottom line, so it’s not surprising that organizations and their executive boards are focusing on ways to encourage inclusion. This article will look at specific benefits of diversity, and ways to encourage inclusion, essentially by allowing multiple voices to share in the story of the company.